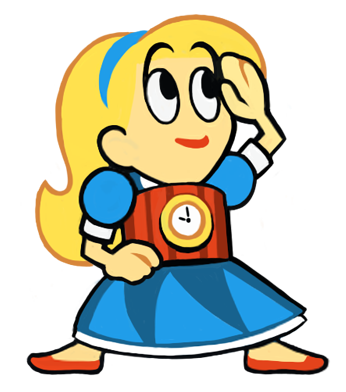 Alice in Bomberland is an upcoming game for iPhone and iPod Touch, developed by Chris DeLeon. Chris designed and programmed Topple, and worked prominently on Boom Blox. He’s also a teacher of game design and all-around profond penseur. One time, he made a game a day for 219 days! We met at a bar and before you know it I was drawing the main character sprite for his new game. We turned her into a simplified, Mario-like game hero, designed to read well at a small scale. Other prominent art is by Mark Meyers. The game itself is an old school survival challenge where you jump around frantically avoiding deadly explosives. In keeping with the source material, it diverges frequently into the surreal, here taking the form of fantastic, disorienting special effects. Now that Alice is done, Chris and I are in preproduction on another game on which I’m the design lead. At this point, it could take virtually any form, although we’re targeting the iPhone/iPod Touch platforms. I’m excited about sharing more information about that at the right time!